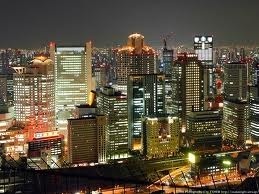 Kita (means North) area is one of two biggest city in Osaka. 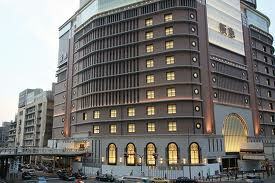 Kita is also known as the name of Umeda. 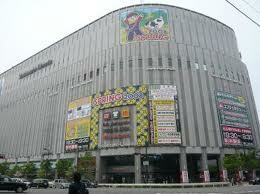 It is located around the big station complex that comprises Osaka and Umeda Stations. 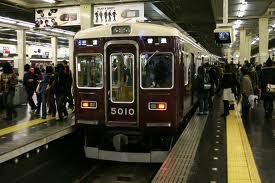 Kita's counterpart is Minami (means South) around Namba Station. Kita is not busiest transportation hub and a bustling business in Osaka, but also has much of shopping,dining, and entertainment spot. 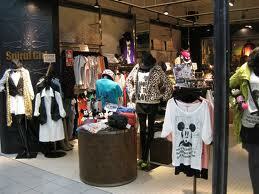 There are a many famous department strores in Kita area such as Hankyu, Hanshin and Daimaru. This is huge electronics retailer. Available every current item of electronics as well as cameras.The top floor offers restaurants with nice views of the city. It is located at north of Osaka Station.This is building complex, height of 173 meter tall skyscraper with the Floating Garden Observatory on its roof. The Floating Garden is open 10:00 - 22:30. Fee 700 yen. HEP is big shopping and entertainment complex.HEP features a red Ferris wheel emerging from its roof, while the entire complex houses over 300 shops and restaurants. Open 11:00 - 21:00 estaurants -23:00. Kitashinchi is an entertainment area, located south of Osaka Station. 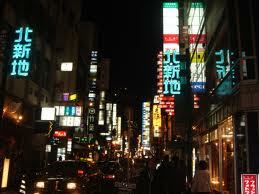 Here you will find hundreds of restaurants, bars and night clubs to suit almost any taste. 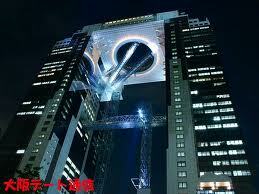 Kitashinchi comes to life after 18:00.